Today, 58% of adults after college will never read another book! Instead they spend 4 hours a day watching TV and 3 hrs listening to the radio. They absorb info still, but not in written form. And since more than 50% in the US prefer to hear than read, we’ve felt the need to adapt our training. Who has the time, or interest, in reading a 3-ring binder training manual? 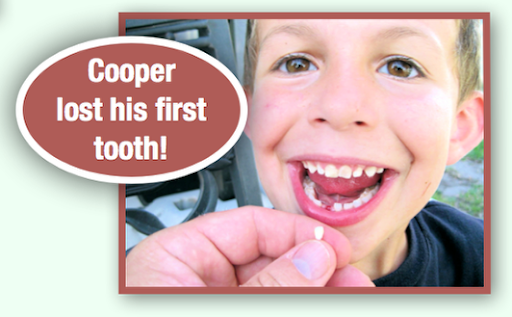 Our goal has been to shorten, simplify, and when possible, convert to interactive video. We want to value the time of volunteers. 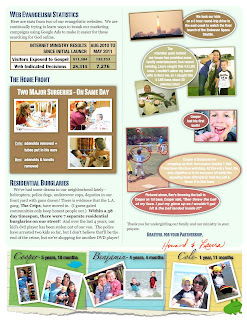 They shouldn’t spend all of their volunteer hours in training, but rather being freed up to minister to students. Most adults can remember life in the “B.C.” days... not “before Christ,” but “before CELLPHONES.” Hard to imagine that most teenagers have never known life without such technologies. Very soon, especially for students, mobile phones will overtake the computer as the most popular way to get on the Web! My hope is that Student Venture will quickly advance our digital strategies to be fully prepared for these rapidly changing times. 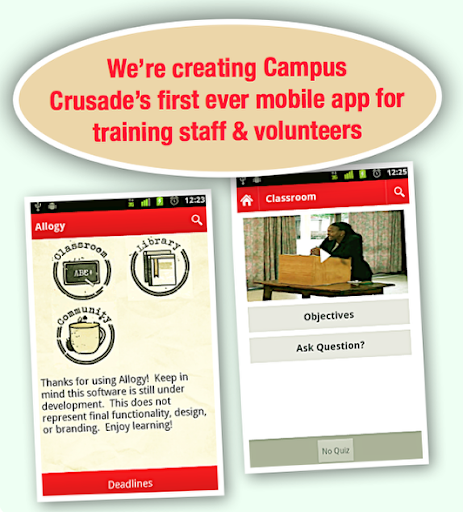 We’re creating Campus Crusade’s first ever mobile app for training staff & volunteers! Our goal: Train Student Venture volunteers in a new way; using the most popular personal electronic device of every high school student, their mobile phone. Create a custom mobile application on both iPhone and Android platforms for Student Venture. 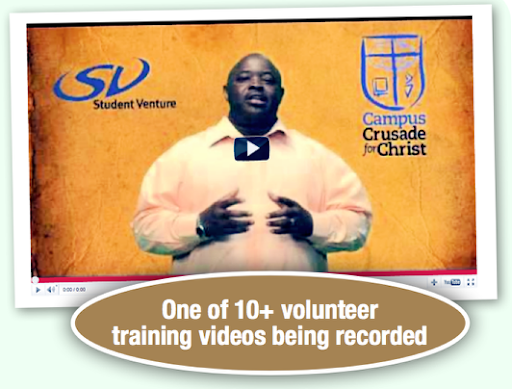 Our ambitious launch date: July 15, in time for SV's all staff training this summer. This initial “1.0” in-house demonstration will include enough functionality for SV staff and volunteers to get an idea of what is being developed. When it is launched, Student Venture's app will be offered in the iTunes App Store and the Google Android App Store as a free application to users. 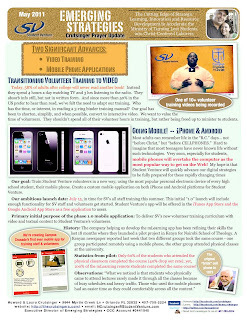 Primary initial purpose of the phase 1.0 mobile application: To deliver SV's new volunteer training curriculum with video and textual content to Student Venture's volunteers. History: The company helping us develop the mLearning app has been refining their skills the last 18 months where they launched a pilot project in Kenya for Nairobi School of Theology. A Kenyan newspaper reported last week that two different groups took the same course - one group participated remotely using a mobile phone, the other group attended physical classes at the university. Statistics from pilot: Only 60% of the students who attended the physical classroom completed the course (40% drop out rate); yet, 100% of the mLearning remote students completed the same course! 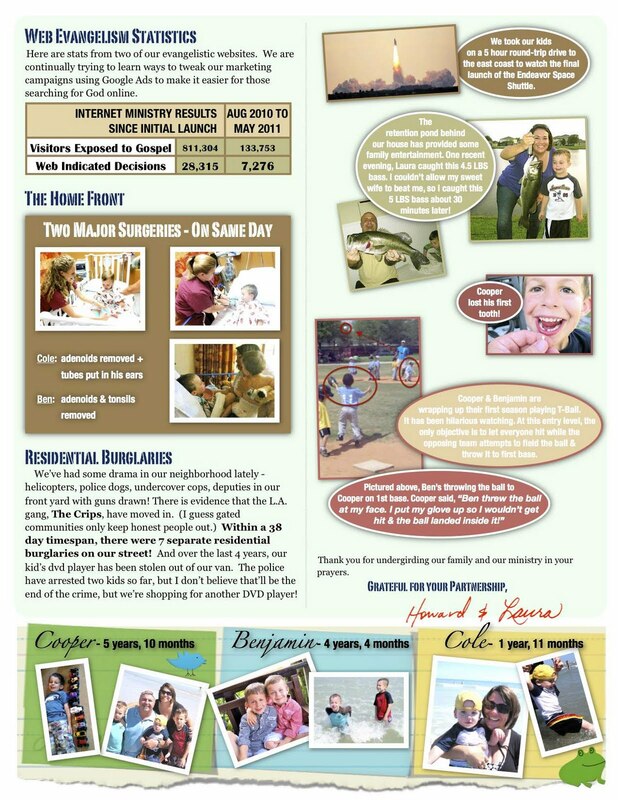 Here are stats from two of our evangelistic websites. We are continually trying to learn ways to tweak our marketing campaigns using Google Ads to make it easier for those searching for God online. We took our kids on a 5 hour round-trip drive to the east coast to watch the final launch of the Endeavor Space Shuttle. The retention pond behind our house has provided some family entertainment. 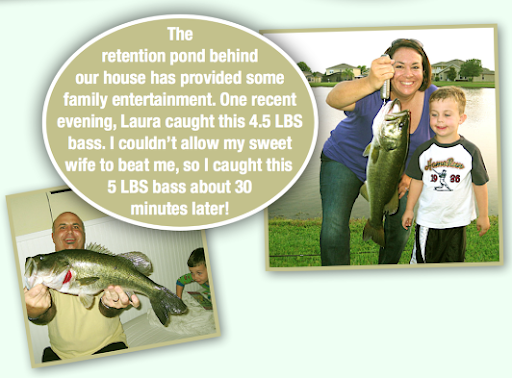 One recent evening, Laura caught this 4.5 LBS bass. I couldn’t allow my sweet wife to beat me, so I caught this 5 LBS bass about 30 minutes later! 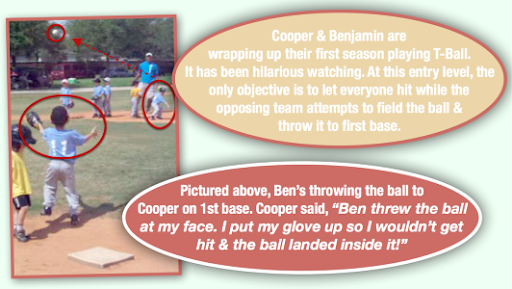 Cooper & Benjamin are wrapping up their first season playing T-Ball. It has been hilarious watching. At this entry level, the only objective is to let everyone hit while the opposing team attempts to field the ball & throw it to first base. We’ve had some drama in our neighborhood lately -helicopters, police dogs, undercover cops, deputies in our front yard with guns drawn! There is evidence that the L.A. gang, The Crips, have moved in. (I guess gated communities only keep honest people out.) Within a 38 day timespan, there were 7 separate residential burglaries on our street! And over the last 4 years, our kid’s dvd player has been stolen out of our van. The police have arrested two kids so far, but I don’t believe that’ll be the end of the crime, but we’re shopping for another DVD player! 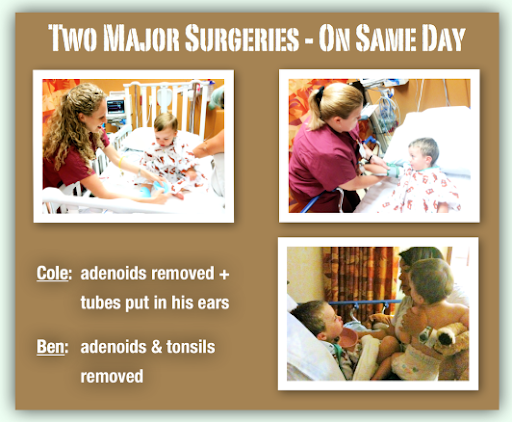 Thank you for undergirding our family and our ministry in your prayers.